Fees completely covered by me. Great Job on the video!! It was a well presented!!! Only thing I didn’t like. Best of luck! @Magnacx At least I am honest. Pretty sure you’ll read “Private use” in many other delegate proposals - between the lines Thanks anyway for the wishes. Please share this video with everyone who wants to know what Delegated Proof of Stake is. My goal is, that this video will be listed at Rank 1 on youtube, whenever anyone searches for a Delegated Proof of Stake video. 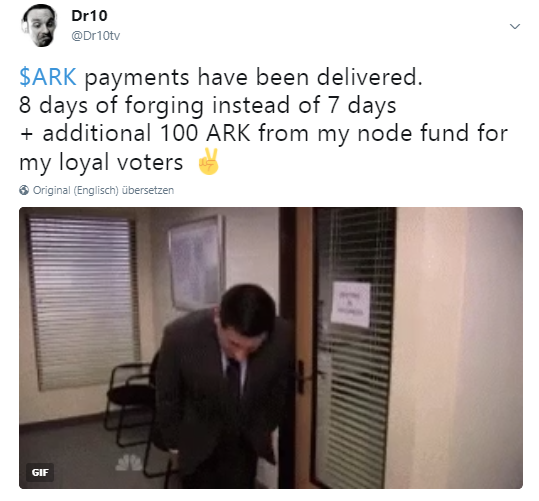 That means: DPOS = ARK, ARK = DPOS. A big voter withdrew his support. I am at the Edge of the Top 51 Delegates. This also means that there is more Profit Share to gain for all + new voters. I hope that YOU consider to vote for me. Or that you will at least create a second wallet adress and vote with a smaller amount for me, just to support my plans. @Magnacx Hard work must be rewarded. @andy99 Currently it’s around 1.95 ARK. But these are measured values. Expect variatons. It’s around this amount. 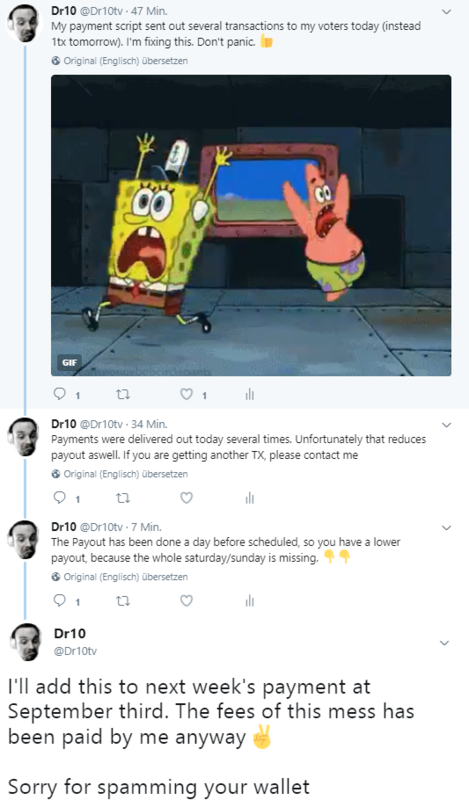 I will keep doing what I’m doing: Raising Awareness for ARK: Thanks for your support! Participate in Lottery and win 0.5 BTC (sponsored by Delegate project fund) - Spread my Aces video! I’m excluding Top 10 voters from my 70% profit share and paying them from my 30% share with a fixed rate, which is higher then the last few weeks. @fc2005 You should check the calulators, like this one: http://calculator.reconnico.com/ and type in the amount of ARK you have. Then you’ll see how much payout you’ll get after a week (I pay out weekly). I am voting for you today, seeing how it is your videos on Ark’s homepage, I think you are a good evangelist for Ark. We can’t trust the team to be focused on spreading the word right now, because they’re hard at work making an amazing platform! I only have 123 Ark but I will be adding more every couple weeks. Cheers! 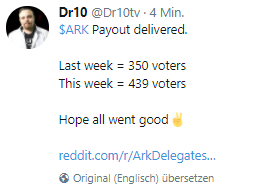 Looks like your connection to Vote dr10 - Youtube/Social Media | Effective Share = 95%-100% | Top10 voters excluded and paid seperately was lost, please wait while we try to reconnect.